Social media erupted Monday night with disappointment and frustration over True Detective star Matthew McConaughey’s loss to Breaking Bad’s Bryan Cranston. I feel your pain, HBO supporters, but don’t cry too long and too hard for McConaughey. After all, he still has that Oscar on his shelf for his outstanding work in the dramatic feature Dallas Buyers Club. And he appears to have an out-of-this-world hit on his radar for later this year – literally – in Christopher Nolan’s Interstellar. It promises to be big. How big? IMAX big, as the latest TV spot reminds. 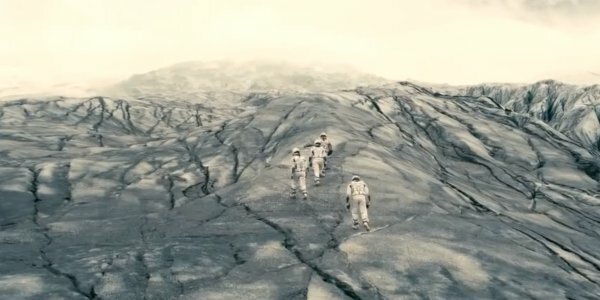 When it comes to pioneering visual advancements, Interstellar director Christopher Nolan leans deeply into the IMAX camp, and appears to ignore (completely) the use of 3D. I can’t say that I blame him. There’s real potential in 3D, but when used improperly, it is a thundering failure. IMAX, on the other hand, gives a filmmaker a much larger visual canvas on which to paint, and Interstellar looks like it wants to fill every crevice with incredible imagery of sci-fi wonder. Where are our astronauts in that image?! I’m going crazy with anticipation. But we won’t know more until November. While we wait, Christopher Nolan has spoken at length about why he prefers IMAX, and to what extremes he’s willing to push that technology to achieve the shots he needs in his features. Come back to the theaters on November 7 to see if Christopher Nolan’s Interstellar was able to immerse you in the unique IMAX experience.